A six-year-old was boy mauled to death by a brown bear after being snatched while playing with his friends – including his twin sister. The children were approached by the wild animal while they were taking part in games on a helicopter pad. Within moments, the bear had managed to grab the boy in front of the terrified youngsters and dragged him into nearby bushes before killing him. The boy’s twin sister managed to escape injury and raise the alarm. 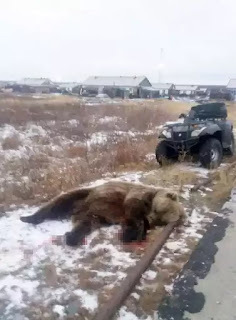 According to the UK Mirror, the terrifying bear attack happened in a remote village in northern Russia – the village of Kheta on the Taimyr peninsula, according to Russian reports. Locals then killed the bear several hours later, she added. The Russian Investigative Committee, equivalent of the FBI, is carrying out a probe into the attack, reported The Siberian Times . This is the latest of a number of reports of aggressive bears this month. The animals are preparing to hibernate for the winter but their natural sources of food are seen as being in short supply this year. The animals are seen far more often encroaching on villages and towns in remote areas of Russia.